Did you resolve to make 2014-2015 the school year to incorporate technology into your classroom? If so, we are here to help — with the redesigned Do-It-Yourself Podcast site. It has a new look, improved navigation and added features that make it more convenient to use. 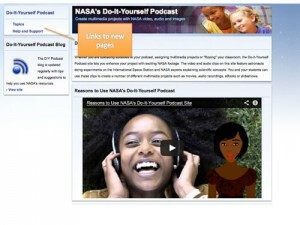 And, on the home page, a two-minute video gives educational and motivational reasons to create multimedia products with the DIY Podcast resources. The left side of the page has a new navigation menu that includes links to two new pages within the site: Topics, and Help and Support.